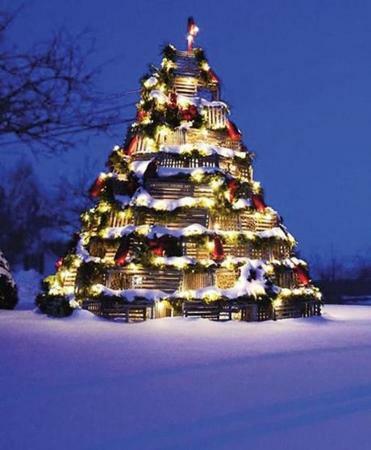 Don’t miss the famed lobster trap tree in Cape Porpoise Square. in Kennebunkport, Maine. This is the season when small towns across New England celebrate the holidays in their own unique ways. There are sleigh rides and Santa arrivals, glimmering candles and bonfires, tree lightings and fireworks, costume guides and re-created Norman Rockwell Christmas villages. New England small towns are picturesque and charming year-round, but they’re especially magical during the holidays. Here are five festive and fun places to visit this season, guaranteed to put you in merry holiday spirit. Downtown shops, inns, and restaurants put on the holiday ritz in this pretty seaside town in southern Maine, with ropes of greenery, wreaths, lights, and decorations galore. Even some the boats in the harbor get decked out for the season. The towering Christmas tree in Dock Square takes centerstage, with hundreds of white lights and lobster buoy ornaments. Don’t miss the famed lobster trap tree in Cape Porpoise Square, also decorated with buoys and bows. A smaller tree is located in Lower Village, Kennebunk. Jump-start your holiday spirit with Christmas Prelude, the annual holiday celebration consistently ranked as one of the best in the nation (207-967-0857, www.christmasprelude.com). The 11-day event, wrapping up Dec. 9, features house tours, tree lightings, parades, fireworks, art and crafts show, trolley rides, bonfires, caroling, and special cocktail parties and dinners. Stay at the sleek Boathouse Waterfront Hotel (207-967-8223, www.boathouseme.com) on the Kennebunk River and within easy walking distance from Dock Square. There are 25 rooms spread across two buildings. The modern, nautically themed rooms in the main hotel are the nicest, and many have water views. Wethersfield is always charming, but especially so during the holiday season. The town, the largest historic district in Connecticut, has 50 houses built before the Revolutionary War, and another 250 built before or shortly after the Civil War. Stroll the 3-mile Wethersfield Heritage Walk to see homes decked out in holiday wreaths (there’s a community door decorating contest) and twinkly lights. The self-guided walk includes 22 interpretive markers throughout Old Wethersfield. Experience the grandeur of a lavish Victorian Christmas at the c. 1790 Hurlbut-Dunham House. Step into the front parlor with its large Christmas tree, elaborately decorated with candles, fruit, candy, popcorn, tinsel, and handmade paper ornaments, and the elegant back parlor, with holiday evergreens, mistletoe, and holly. Free tours will be offered Dec. 8-9. Stay at the award-winning 1873 Silas W. Robbins House Bed and Breakfast (860-571-8733, www.silasrobbins.com), an elegant Victorian overlooking the picturesque Broad Street Green. The historic, three-story house has five modern rooms with private baths and period furnishings. If you’re seeking an old-fashioned holiday, head to this throwback small town that Norman Rockwell captured in his 1967 painting “Home for Christmas (Stockbridge Main Street at Christmas).” The timeless town is always charming, but especially so during the holiday season when shops are festooned with green boughs and wreaths and glimmering lights. Stroll down Main Street, with a stop at the historic Red Lion Inn (413-298-5545, www.redlioninn.com), decorated to the hilt with Christmas trees, baskets of evergreens and holly, kissing balls, red ribbons, and lights. The inn’s wraparound front porch is the perfect place to enjoy a hot toddy, and watch the people go by. The Red Lion Inn in Stockbridge. A visit to the Norman Rockwell Museum (413-298-4100, www.nrm.org), housing the world’s largest collection of Rockwell’s work, is a must. The artist’s warm holiday illustrations that once graced the covers of popular magazines and Hallmark cards are sure to get you in the spirit. The museum hosts a variety of special events in December, including craft workshops, tours, and talks. Don’t miss Winterlights, premiering this holiday season at Naumkeag, a National Historic Landmark and Gilded Age mansion owned by The Trustees (413-298-3239, www.thetrustees.org/winterlights). Shimmering lights will illuminate the restored gardens, with live performances, visits from Santa, a Frozen themed family night, and children’s activities. It runs Thursdays through Sundays until Dec. 30. Gorgeous splendor is on display in this holiday-happy coastal town, dedicated to celebrating the season. Thousands of tiny white lights illuminate historic homes, shops, restaurants, and the bustling wharves, meant to represent candlelit homes during seafaring times. The city is aglow. The monthlong Christmas in Newport celebration (401-849-6454, www.christmasinnewport.org) offers programs and events for all ages, and most are free or benefit a nonprofit charity — in the true spirit of the holiday. There are holiday home tours, shopping strolls, lantern-lit walks, craft fairs, bake sales, concerts, Polar Express train rides, culinary fetes, and contests, including a doorway decorating battle. Stroll to see the decorated doors and holiday displays, and stop at the Newport Marriott to check out the 16-foot tall lighthouse made of 350 pounds of gingerbread and more than 2,400 pieces of candy. Three of the Gilded Age mansions — The Breakers, The Elms, and Marble House — are filled with fresh flowers, evergreens and wreaths, lavish decorations, and 30 decorated Christmas trees. Dining rooms are set with period silver and china, candles glow, and holiday music plays. Special events, including Santa visits and concerts, are also held. Stay at the Attwater Inn (401-846-7444, www.theattwater.com), a sleek boutique with bright, modern rooms, contemporary furnishings, and splashes of bold color. It’s within easy walking distance to main sights, shops, and restaurants, but tucked away just enough to offer an oasis from the holiday hustle and bustle. Being in this small town during the holiday season is like being in the middle of a holiday snow globe, complete with an historic 1876 red-painted covered bridge, a village green and gazebo, and beautiful country inns with boughs of greenery, pots of poinsettias, wreaths, and lights. The snow-capped White Mountains serve as a backdrop. The town starts the holiday celebration early, with the popular Jingle Bell Chocolate Tour, held on weekends through Dec. 16. Participants are invited to take a horse-drawn sleigh ride through the village, stopping at inns, shops, and bakeries to sample homemade chocolate treats. The Traditionally Yours Holiday Celebration began on Nov. 23 and continues over the next four weekends, with Santa visits, tree lightings, open houses, craft fairs, and food and drink tastings (603-383-9356, www.jacksonnh.com). At the 65-acre Nestlenook Farm Resort (603-383-7101, www.nestlenookfarmsleighrides.com) you can take a horse-drawn sleigh ride to Santa’s Workshop, make s’mores over roaring firepits, and go ice skating on Emerald Lake (weather permitting). To really get into the holiday spirit, stay at the down-home Christmas Farm Inn, where the holiday is celebrated year-round, but gets extra attention during the season (603-383-4313, www.christmasfarminn.com). There are decorations galore and miles of boughs and red bows. Have drinks in the Mistletoe Pub and stay in rooms named Rudolph and Everything Nice, or opt for a private cottage with a working fireplace, or a modern suite in the Carriage House with spa tubs and gas fireplaces. And give yourself an early present: a treatment at the inn’s Aveda Spa.